No problem! Just browse our wide range of specially designed gift boxes and add a touch of elegance and class to your gifts. Give your bullion coins the home they deserve and add some of our specially designed coin boxes to your order. Stacking won’t damage your coins, provided you store them in the right box. Master boxes are a great buy for investors who want to store larger quantities. 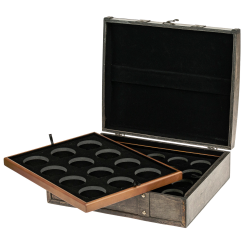 We offer a wide range of standard coin boxes as well as special boxes like the Gold Britannia Master Box for 100 coins, the Silver Britannia Master Box for 500 coins or the Vienna Philharmonic Master Box in Gold and Silver for 500 coins.